On April 17th, a bunch of DSP Flowers (Scrapping Friends) met at the Carlsbad Flower Fields and bloomed in the warm sun together. We had a great time taking pictures of the the tasty smells and trying on some really gorgeous hats. Nice Easter Scrapbook Layouts, although would have love some simple instructions on how to create similar Easter Layout. Join in and write your own page! It's easy to do. How? 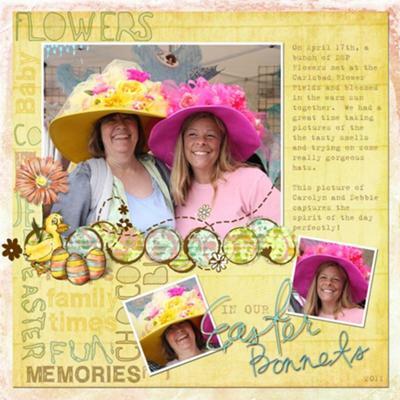 Simply click here to return to Easter Scrapbooking Layouts Reviews.